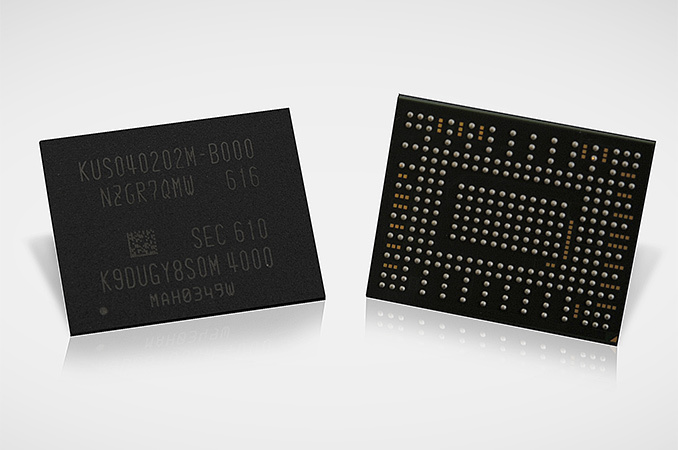 Samsung this week said that it had begun mass production of its first SSDs in BGA form-factor. The PM971-NVMe tiny drive weighs about one gram, can store up to 512 GB of data and offers up to 1500 MB/s read speed. The SSDs will be used inside 2-in-1 hybrid computers, high-end tablets as well as ultra-thin notebooks later this year. Samsung demonstrated its first BGA SSD earlier in 2016 and most of its specifications are generally known. The PM971 is based on up to 16 Samsung’s second-generation 48-layer MLC V-NAND. The SSD relies on Samsung's proprietary controller called Photon, which can extract high performance from a limited number of NAND channels and ICs thanks to architecture as well as the company’s proprietary TurboWrite technology. The PM971-NVMe SSD is equipped with a 512 MB LPDDR4 buffer, uses a PCIe 3.0 x2 interface and supports NVMe. Samsung will ship three versions of its PM971-NVMe BGA SSDs with 128 GB, 256 GB, and 512 GB capacities, which will be enough for modern convertibles, tablets and ultra-thin laptops. Dimensions of the PM971-NVMe are 20 mm × 16 mm × 1.5 mm and the weight is just about a gram. Judging by the physical sizes of the package, it seems that the new PM971-NVMe BGA SSDs from Samsung comply with mechanical specifications for BGA SSDs proposed by multiple companies to JEDEC last year. In any case, the key message here is that Samsung’s BGA SSDs are significantly smaller than the smallest M.2 modules and can thus save space inside SFF PCs to make them either thinner, or prolong their battery life. The PM971-NVMe SSD supports sequential read speed of up to 1500 MB/s as well as sequential write speed of up to 900 MB/s when the TurboWrite technology is enabled (earlier this year the company mentioned 600 MB/s write speed, but did not mention the TurboWrite). 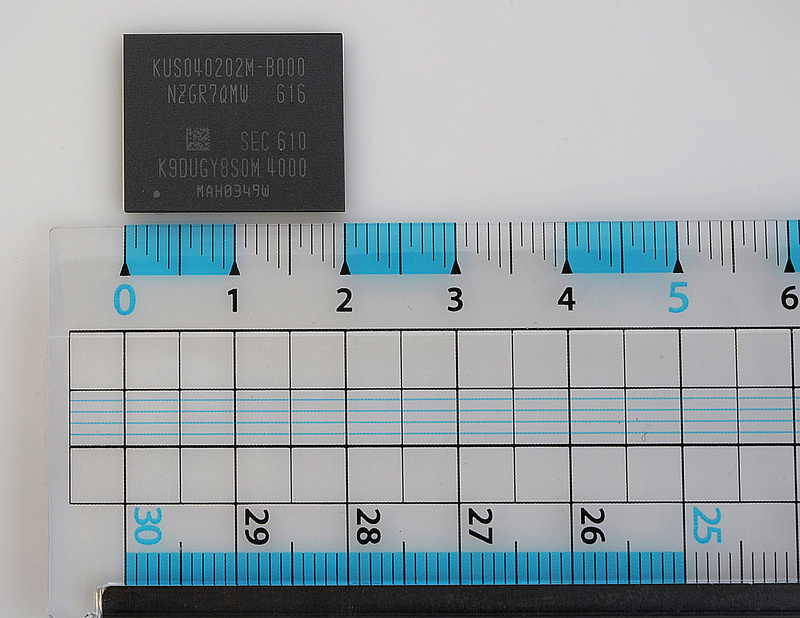 Samsung’s TurboWrite technology uses a portion of SSD’s NAND memory in pseudo-SLC mode, which significantly improves writing performance of the drive. Typically, Samsung uses its TurboWrite for its TLC NAND-based drives, which makes the PM971-NVMe the company’s first MLC-based SSD with a pseudo-SLC buffer. At this point we are not sure how exactly Samsung’s TurboWrite works in the PM971-NVMe and whether it speeds up or optimizes anything else apart from writing performance (since it is actually easier to read from SLC cells, the pSLC buffer can also help to improve read performance and even reduce power consumption). As for random performance, the PM971-NVMe SSD can perform 190K random read IOPS as well as up to 150K random write IOPS, according to Samsung. Since the PM971-NVMe BGA SSDs are not designed for end-users, but for large PC suppliers as well as their OEMs/ODMs, Samsung does not disclose their prices. Right now, the company says that the it would start providing the new SSDs to its customers “this month”, which is not really relevant because the announcement was made on May 31. However, keep in mind that memory companies usually do not announce mass production until they have quantities of finished products ready to deliver to customers. Therefore, the PM971-NVMe drives may show up in actual devices sooner than one might think.